Oil on canvas, 23 x 27 in. Midsummer was the painting that Alice Roney Hardwick selected in 1917 to represent her late husband in the collection of the Museum of Fine Arts, Boston. Hardwick, who had died the previous year, was a well-respected mainstay of the Boston arts community. A painter of obvious ability, Hardwick devoted his energy primarily to watercolor. His decision to concentrate his effort on the inherently modest medium of watercolor is the reason why he is relatively obscure today. The known details of Hardwick’s life are sparse and must be pieced together from a variety of sources. The artist was born in Digby, Nova Scotia, Canada, a community founded in 1783 by American loyalists. He married Alice Roney, a Chicago native who was also an artist. A generation younger than her husband, the two are said to have met when Alice was a student at the Art Student’s League in New York, and Hardwick was her teacher. That is the only reference to Hardwick as a teacher, and the only mention of any presence in New York. Roney, born in 1876, would likely have studied at the League in the late 1890s. The subjects of Hardwick’s landscapes and genre scenes document favorite venues and thus yield a second important source of information. It is clear from his works that he spent considerable time in Holland and Belgium. Hardwick studied with two men, S. P. Rolt Triscott and Bernardus Johannes Blommers. The first of these, Samuel Peter Rolt Triscott (1846–1925), was an English expratriate who specialized in watercolor landscapes, lived in the Boston area, and became the first year-round artist resident of Monhegan Island in 1902. Hardwick doubtless encountered him in the Boston area. Blommers (1845–1914), a Dutch artist affiliated with The Hague School, was popular in England and made a trip to the United States, but the likelihood is that Hardwick studied with him in Europe. Hardwick enjoyed a successful career in Massachusetts, producing attractive landscapes, genre, and marine paintings. Although he was primarily a watercolorist, the exhibition record reveals a steady but relatively small production of oil paintings. Hardwick exhibited occasionally at the Pennsylvania Academy of the Fine Arts, Philadelphia, the National Academy of Design, New York City, and once, in 1907, at the Corcoran Gallery of Art, Washington, D.C. His principal exhibition venues, however, were the Boston Art Club and the Art Institute of Chicago, where he participated extensively in the annual watercolor shows that both institutions sponsored. The Chicago connection may well relate to ties that Alice Hardwick maintained with her city of birth. Melbourne Hardwick first exhibited at the Art Institute of Chicago in 1891, then from 1898 to 1902 and again from 1905 through 1910. Hardwick’s major venue was the Boston Art Club, where he exhibited every year from 1888 through 1909. (He doubtless exhibited there past 1909. Club records for the later period are incomplete and unpublished.) Hardwick was an active member of the Boston Art Club. He served in various years on the Committee on Exhibitions, the Committee on Hanging, and the Jury on Admission. In 1904, he was a member of the Executive Committee, and, in 1907–08, was Vice President. The Boston Art Club hosted a “Memorial exhibition of paintings by Melbourne H. Hardwick” in 1917. Hardwick was also a member of the Boston Society of Watercolor Painters, the Connecticut Academy of Fine Arts, and the Salmagundi Club in New York. In Midsummer Hardwick visits a favorite theme of contemporary American painters. 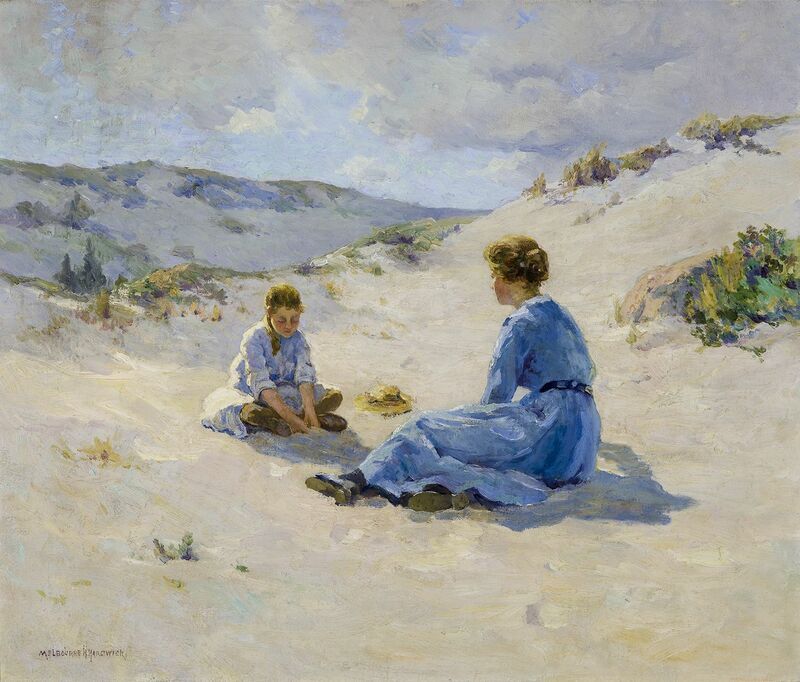 On beaches along the Atlantic shore from New Jersey to Maine artists painted attractive young women enjoying bright sun and fresh breezes on scenic coastal dunes. 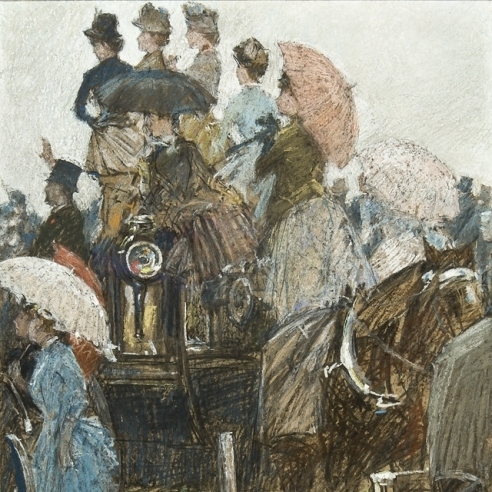 An iconic American impressionist topic, some of the artists also used the occasion to also explore impressionist painting techniques. Hardwick is content to paint the scene as it might have appeared to an invisible observer, in this case the viewer. A girl sits cross-legged on a flat expanse of sand spotted with tufts of grass. Nearby is a gentle hillock. Her straw hat rests next to her while the sun shines on her back. She seems absorbed in sifting the sand in front of her, which is cooled to a comfortable temperature by the shadow of her body. Across from her is a young, woman, seated face to the sun, back to the viewer. The artist provides no narrative. Neither of the two figures is aware of the viewer, and their relationship, as well as their interaction (or the lack of it) remains a subject for conjecture. As the exhibition records evidence, Hardwick titled his works and, given the provenance, it is likely that Midsummer is Hardwick’s own name for the painting. That simple title, consistent with the feeling of the image, evokes the time of year when duties and responsibility recede in favor of a succession of long sunny days filled with hours of easy leisure.